NEW YORK (WABC) -- The Better Business Bureau released its top ten consumer complaint categories from New Yorkers in 2015. Financial service complaints, such as banking or credit card issues, topped the list for the seventh year in a row. That was followed by complaints concerning telecommunications. In third place were health, beauty and fitness, followed by automotive, and electronics and appliances complaints. 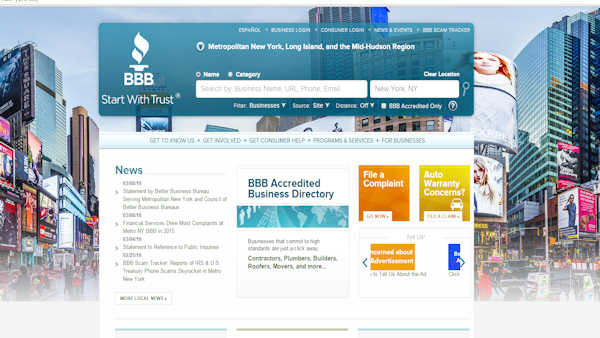 While consumer complaints declined by 9 percent to 47,488 in 2015, Metro New York BBB received more than 9,000 Customer Reviews from consumers - the first full year the service has been offered - and inquiries from consumers into Metro New York businesses increased by 9 percent to 4.9 million.